This audio digitizer lets you easily record live audio or transfer analog audio into a USB drive or SD memory card in digital MP3 format so you can listen your newly-created digital music on MP3 player, iPod or iPhone or other portable audio players. This easy-to-use converter provides users an easy solution to digitize analog audio feed into digital format through the convenient interface. Users can easily capture favorite music, sound tracks, audio feeds from audio sources such CD/DVD player, computers, tablets , musical keyboards, Hi-Fi system, MP3 players and save the recorded audio feeds into a USB drive or SD memory card before producing audio CDs, MP3 CDs for playback, editing or disc production. Users may also use this audio recorder to convert old collection of cassettes, vinyl records and LPs into crisp, clear digital audio files for music on the go and then create audio CDs and MP3 CDs for personal audio library and make archive of life-time collection that will not degrade or deteriorate over time. This analog audio digitizer supports audio recording from two types of audio inputs, one in 3.5mm stereo mini and the other in RCA phono L/R. This recorder has a USB OTG port and SD card slot for saving the recording results. [Note]: Users can plug either a USB drive or SD card into this device but not both at the same time. And please make sure the USB drive or SD card used are formatted in FAT32 (FAT) or exFAT style (not NTFS). This digital audio recorder has 1 of 3.5mm line out port for user to hear the playback from stereo speakers or earphone for listening the playback of recorded audio files or monitoring the recording process. This digital audio recorder supports both automatic recording and manual recording. At auto mode, the recorder will automatically detect each time interval between 2 songs so it will know to when to finish a MP3 file and start a new MP3 file with partition. Manual mode allows users to decide when the next song starts by short press the "NEXT" button of the IR remote to skip and start another file for recording of next song. This audio recorder provides an IR remote for ease of operation. The IR remote provides control of all the tasks such as record/stop, play/pause, fast forward/rewind, volume up/down. This audio recorder is also a MP3 player as it supports direct playback from the recorder itself. Users can listen to the playback of the recorded music files stored into the USB drive or memory card directly from the 3.5mm headphone output to check or verify if the recording properly done. Or users can also use a computer host or portable media player for playback of the recording. Premium audio digitizer for recording live audio in MP3 format and saved into external USB drive or USB flash or SD memory card for direct play later. 2-In-1 MP3 recorder and player with USB input + SD card slot. 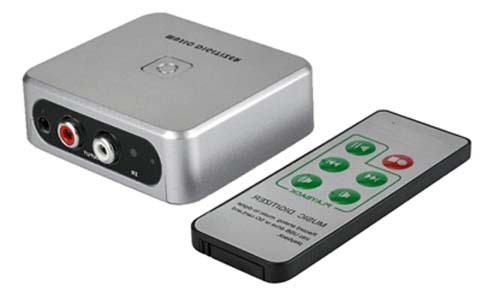 Supports both RCA L/R phono input and 3.5mm line input for capturing audio from devices such as tape deck, cassette player, turntable, LP, mic, computer, DVD player, audio receiver, mixer and so on. Rediscover the beauty of those good old music with the help of this audio digitizer. This digital audio recorder supports both automatic recording and manual recording. Automatic mode can automatically detect each time interval between songs so it will know to when to finish a MP3 file and start a new MP3 file with partition. Manual mode allows users to decide when the next song starts by pressing NEXT button of the IR remote to skip and start another file for recording of next song. Easy IR remote operation for all the tasks such as record/stop, play/pause, fast forward/rewind, volume up/down. Direct playback from the recorder itself or using a computer host or portable media player for playback of the recorded music saved in the USB drive or memory card. 1 of 3.5mm line out port for user to hear the playback from stereo speakers or earphone for listening the playback of recorded audio files or monitoring the recording process. No hookup with a pc or portable media player needed for playback. Standard DC 5V 1A power supply. Unit can be powered from the AC/DC power adapter included or USB port.